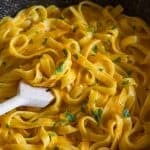 Pasta Pepper Cream Sauce is a delicious anytime easy and simple cream sauce for any type of Pasta. So good and perfect for dinner tonight. 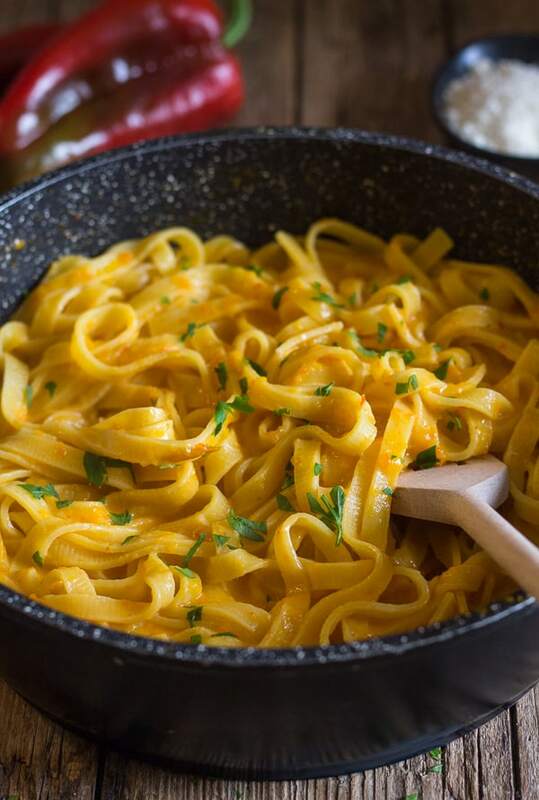 Pasta Pepper Cream Sauce one of my favourite go to recipes for a delicious homemade Pasta dish. I will be the first to admit that I was so lucky to have a mother-in-law who is not only a great cook and a great teacher, but also a wonder in the vegetable garden department. Every year I would tell her ,” You plant enough vegetables to feed the country” , but when I was given one of her bags full of fresh delights from the garden I never complained. I remember one year when there was an overload of peppers. I was so glad to receive that bag full, and I knew exactly what I was going to do with those peppers! First off I made a big pan of Pepper Pepper Cream Sauce, and the rest well I did roast some and some I cut cleaned and cut them up stuck them in freezer bags and froze them for the next craving of this amazing Pepper Cream Sauce. And I knew it was going to happen often! Every time I go visit my sister in Toronto, it is the first dish she asks for. As she always tells me Pasta and Pepper Cream Sauce is her favourite Pasta dish. I usually make this dish with a couple of red peppers and either a green or yellow one, the Italian thinks the sauce is too sweet with all red peppers. Then in a large pan I simmer the peppers with a little olive oil, salt and some water. Once the peppers are tender then I pass them in a food mill not a blender because you don’t want the skin you just want the pulp from the peppers. 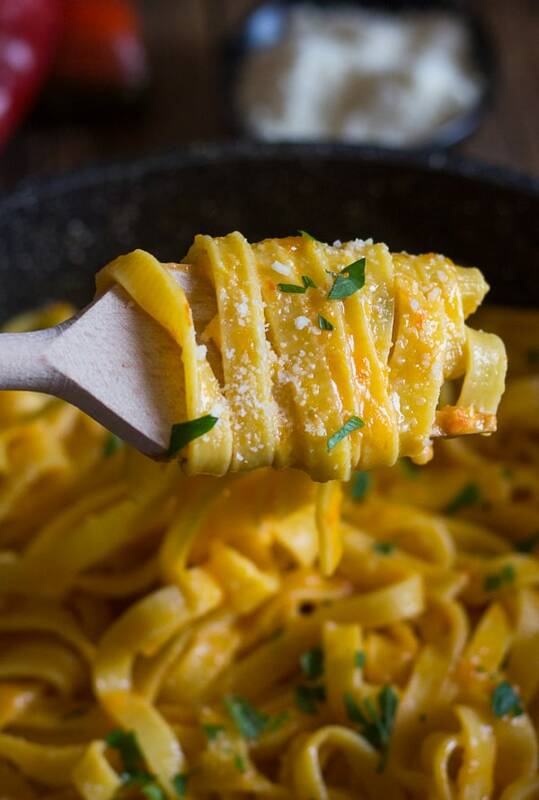 More Pasta Cream Sauces you may Enjoy! Add the pulp back to the pan and stir in some cream, then add your favourite pasta, toss it all up and serve. I like a sprinkle of Parmesan cheese! Buon Appetito! 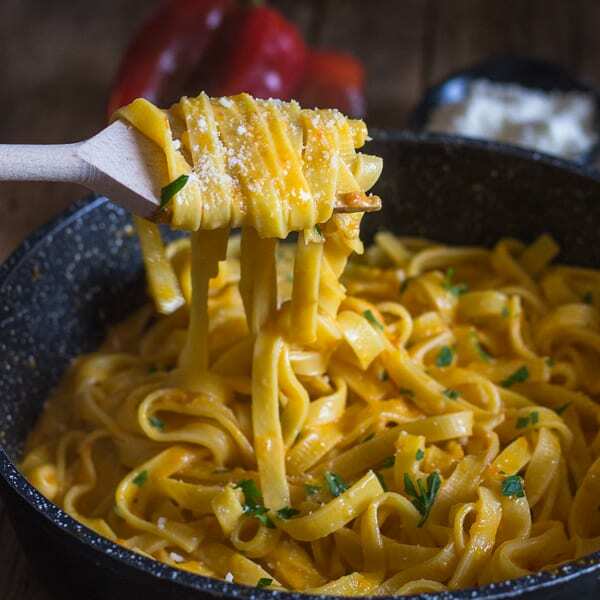 In a medium pot add olive oil, peppers, salt and water, cook on medium heat for approximately 20 minutes until tender (15 minutes covered, 5 minutes uncovered)*( At this point you can start your water boiling for the pasta, cook pasta al dente). Once cooked, place a clean bowl underneath your food mill using the smallest holed disk and begin to pass the peppers (almost all the liquid will be gone, but don't drain any liquid that might be remaining no more than approximately 1 tablespoon), Depending on the size of your food mill you might have to pass 1/2 the peppers at a time. 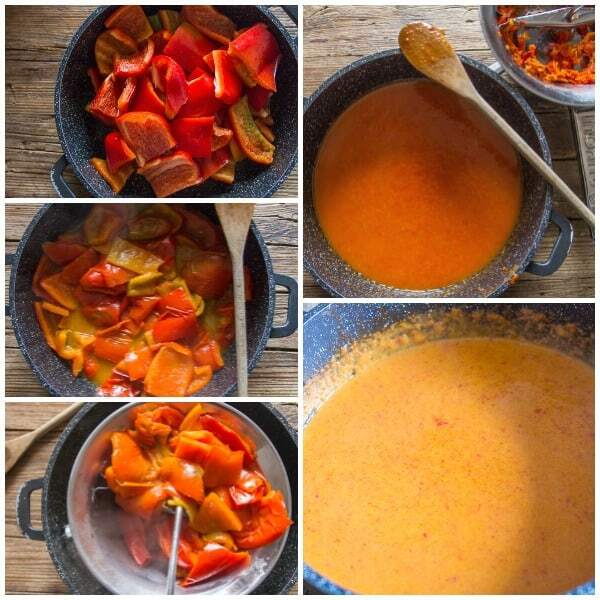 Remember do not use a blender, a food mill, because we want the pulp of the peppers not the skin. The food mill step can take up to 15 minutes, pass a spatula underneath the disk every now and again to loosen pulp into the bowl, and keep turning because there is a lot of pulp in these peppers. (careful not to let any pepper skin fall into the bowl, remove if this happens). Once all the peppers have been passed, pour the pepper sauce back into the medium pot, place on medium heat and add the cream, heat until boiling, simmer on a low boil for approximately 5 minutes. Toss with cooked pasta , serve immediately with freshly grated parmesan cheese. Buon Appetito! Republished from January 13, 2014. 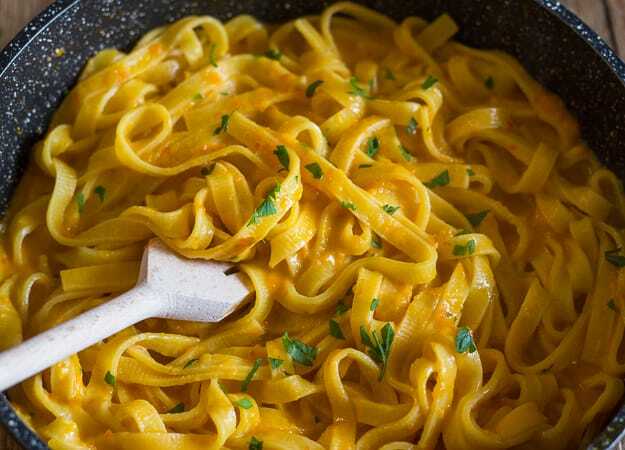 I love pasta and this looks really tasty I love a little spice with my sauce. I must try this tomorrow. Hi Violet, thanks for stopping by. Enjoy! Thanks Linda, I will set you a spot at the table. Excellent recipe! Pasta is served almost daily in our house so I love trying new recipes for it! Hi Susan, thanks, I personally think this is a great pasta recipe, let me know what you think. Love trying new Italian recipes! thank you! Pinned! Thanks Katherine, you have helped me make it more fun and I love the Thursday blog hop. omg!!!delicious. thanks for sharing. keep them coming.